Walking into the Duncan Public Library, one would never know it’s located in a small rural community. The layout is spacious and beautiful, with rows and rows of books on every imaginable subject, a bright and airy children’s area and many computers scattered throughout the two-story building. Natural light streams in on the patrons as they sit reading a good book, working on a computer or chatting with a friend. 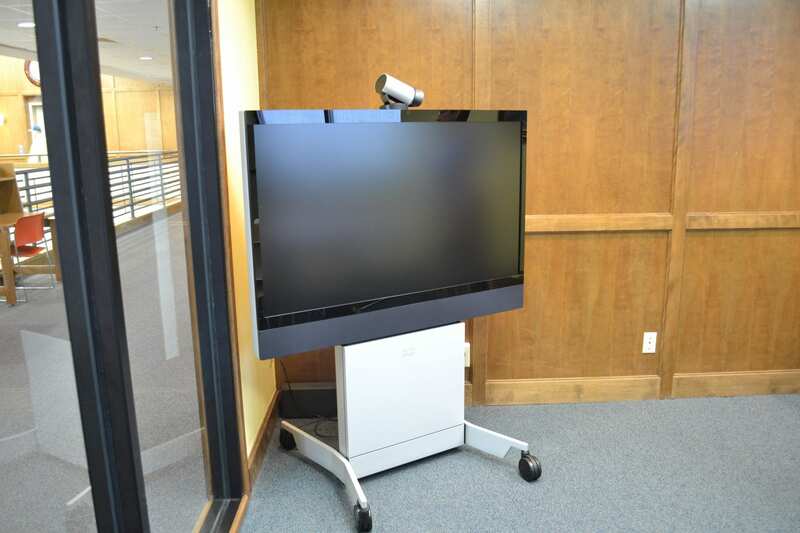 Visitors will also find that the library’s technology is much more advanced than would be expected, with computers, laptops, tablets, wireless printers, videoconferencing equipment and even a Promethean interactive whiteboard. 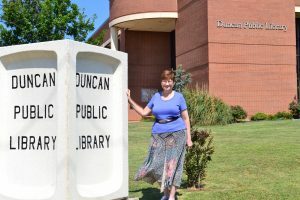 Duncan Public Library Director Jan Cole and the rest of her dedicated staff refuse to let the challenges they face as a library in a rural Oklahoma community prevent them from offering the latest technology to their patrons. With the help of OneNet and the Oklahoma Community Anchor Network, the library is able to provide services they wouldn’t have otherwise been able to support. For example, before their recent OneNet circuit upgrade, the library’s network could only support about eight computers for their patrons. Now, with the higher broadband capacity, they provide 18 computers for public use and can also easily support any patrons who bring their own laptops. This greater number of machines, in addition to the high-speed Internet, is crucial to providing services the Duncan community needs. Jan sees some recreational use of the computers, such as checking social media and email, but they are now more commonly used for business and personal matters. People fill out job applications, seek legal assistance, apply for social security and conduct business when they can’t access their Internet at home. As a community anchor institution for the Oklahoma Community Anchor Network, the library’s capabilities will continue to expand with the completion of OCAN on July 31, 2013. OCAN is a newly constructed broadband network that reaches 35 Oklahoma counties and provides 1,005 miles of infrastructure to support a variety of projects. OCAN’s fiber path impacts 89 percent of the state’s population. Through OneNet, OCAN will create opportunities for rural Oklahoma communities that simply didn’t exist until now. OCAN will enable Duncan Public Library to serve more people through the increased bandwidth the network will provide. More people in the community will also be able to take advantage of the library’s many unique programs, such as database usage classes and a class on dinosaurs as part of their children’s program. “OCAN is erasing the digital divide,” Jan said. The new connection will also easily enable the use of the new videoconferencing equipment Duncan Public Library just received thanks to a $3,353,062 grant awarded to the Oklahoma Department of Libraries (ODL) by the National Telecommunications and Information Administration and the Bill and Melinda Gates Foundation. This grant helped provide computers, bandwidth upgrades and equipment to 44 libraries in Oklahoma. 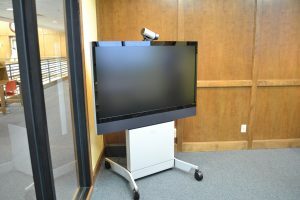 These crucial upgrades will open up a whole new world for the libraries that received them, just as videoconferencing capabilities will present more opportunities and possibilities for the town of Duncan and its library. Students can take classes; patrons can attend seminars and webinars, and library employees can participate in ODL classes in Oklahoma City without moving from their workplace. All these things and more will be possible with the new equipment and the faster OCAN connection. OCAN’s upcoming completion is perfect timing. Soon even more patrons will flood the library to access the library’s computers. The new Affordable Care Act starts Oct. 1, 2013, and the 15 percent of Americans who are uninsured will begin researching and choosing health coverage, primarily online. This presents a problem for those without access to Internet. That’s where local public libraries come in. Though there are no federal funds to support the program, libraries are being encouraged by the American Library Association (ALA) and the U.S. Department of Health and Human Services to disseminate information about the plans and to provide computer time to the millions of uninsured Americans looking for health insurance. However, some libraries may not have the broadband to support all the extra computer usage. Duncan Public Library would be one those struggling libraries if not for OneNet’s services. Jan is grateful for the high broadband capabilities OneNet provides. “We are able to offer better quality of services and more services to our library customers,” Jan said. Thankfully, when Oct. 1 and the healthcare initiative roll around, Duncan Public Library will have more than enough bandwidth to meet the extra demands on their system. While the library has been able to expand services, one of the problems they face is updating their technology quickly enough. “Keeping up with technology is one of our biggest challenges,” Jan said. Their problem is understandable, given the limited budget and ever-increasing traffic the library receives. Despite their difficulties, they do an amazing job staying technologically relevant within the library and the community. Rich Cassidy, technology instructor at Duncan Public Library, gives free classes on how to use a wide array of devices. These are “at-your-own-pace” classes for anyone from age six to 80. He has found that individual instruction is the most successful, so anyone struggling with their electronic device can make a 30–minute appointment on Tuesdays from 6:30-7:30 p.m. or on any other day from 2:30-5:30 p.m.
Rich starts by asking his students what two main things they want to do with the device. Once this question is answered, the goal for the first session is basic familiarization with the device. The student can come back as many times as they need to until they become completely comfortable with using their new device. The library has also been able to provide five tablets that they let patrons check out for three days at a time. This service has been a great success, as it provides library customers with a mini computer they can use when the library isn’t open. These are just two examples of the effort Jan and the Duncan Public Library are making to reach out to the community. OneNet helps enable this outreach through high-speed Internet and high-capacity broadband services. Although OneNet facilitates the library’s Internet services and bandwidth needs, it’s the dedication of people such as Jan and Rich that really grows rural community libraries like the Duncan Public Library. With excellent leadership, OneNet’s leading edge technology services and OCAN, the possibilities are almost endless for this small-town library. For more information on the Oklahoma Community Anchor Network, contact Sonja Wall, OneNet OCAN Program Manager, at 405-225-9345 or swall@osrhe.edu. building I see new and encouraging processes being implemented.